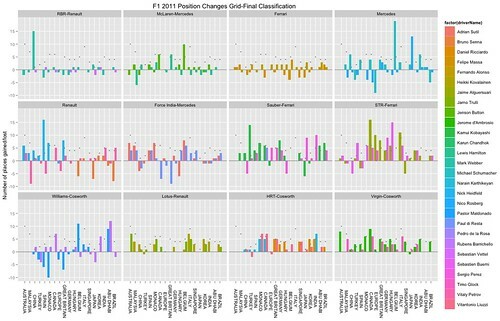 How does each team fare in terms changes between starting grid position and final classification across the races? In this case, the line extends from grid position to final classification, and is coloured green for an improvement, red for a drop. The grey circle highlights the grid position, the grey + denotes the number of cars that were unclassified at the end of the race.